Firstly, I had a GREAT mail day on Tuesday. Perfectly suited for a day dubbed "Tushie" by us! Can we say cuteness overload? I have been patiently waiting for these guys that I ordered from a Co-op for weeks!! So cute! I can't wait to prep them and get them onto Emmett's little behind! Disclaimer: I did not receive product in compensation for this review. These opinions are my own and were in no way influenced by the company nor was I asked to write this review. My Blueberry diapers were the first CD that I truly loved. They were also the only newborn sized diapers that we purchased. Why love at first sight? Why do I love most of my diapers - the designs! We have owls, monkeys, handprints, giraffes, elephants, monsters and cow prints! Snaps and hook and loop. Needless to say we LOVE our Blueberry Diapers! These diapers get an amazing fit! Even around Emmett's chubby thighs. They are super absorbent but keep him dry! Blueberry offers so many choices (minky, bamboo, cotton/micro) that there is a diaper for everyone. I love that you have the option of tucking in the soaker on the AIO (like a pocket) to keep a more natural fabric on babes skin. The ONLY thing I don't like about my Blueberry Dipes is that there isn't a wing or cover over the opening. Occasionally the microfiber insert will ride up and touch Emmett's skin. He is really sensitive so he usually gets a rash from this. Solution for us has been to use a bamboo or hemp insert that is friendly to his sensitive skin. Blueberry Diapers cost around $25 but are so worth the price! Plus they are made in North America (unfortunately, no, not Canada). My biggest regret about Blueberry Diapers? I didn't know how much I'd love the hook and loop when I started my stash and was convinced I'd love snaps more (which I DON'T!) and this fab dino diaper eluded me because I could only find it in hook and loop...AND since I've been forbidden to purchase anymore fluff (since our stash is around 70?) it will have to wait. Boo. 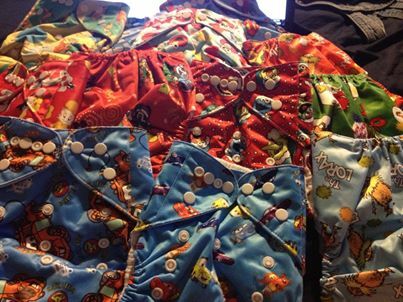 If you don't have any of these fab diapers in your collection? You should. Go get some!